Founded by Thomas W. Radcliff. Thomas W. Radcliffe and James S. Guignard. Was in the partnership of Glaze & Radcliffe 1848-1851 with William Glaze and later Radcliffe & Guignard 1855-1858. Operated under the name of T.W. Radcliffe & Co. 1852-1855. 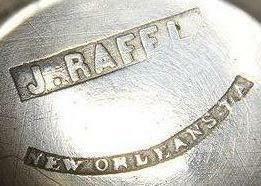 Radcliffe died in 1870, and his business was continued by his son Thomas Radcliffe, Jr. and a friend Richard Davis until 1897 when it was succeeded by Sylvan Bros.
Makers of handwrought sterling holloware. Makers of sterling and silverplated holloware and novelties. Acquired W. & S. Blackington Co. in 1966. Flatware Patterns by Raimond Silver Mfg. Co. In the firm of Robert Rait & Co. 1857-1862. Silversmith, jeweler, and retailer. Milton C. Ramsey and Preston W. Ramsey. Successor to C.W. Kennard & Co. Primarily a retailer, they made a few lines of sterling flatware. holloware, many of their earlier works being predominantly in the Arts & Crafts style. Acquired by Reed & Barton in 1965. Manufacturing jeweler; also made small sterling novelties. In the partnership of N.O. & N. Randall with Nathaniel Randall 1842-1843. Bethuel Ranger and Henry H. Thompson. Anthony Rasch / A. Rasch & Co.
Partnered with Simon Chaudron in the company of Chaudron & Rasch 1809-1812 then in 1817 with George Willig, Jr. in the firm of A. Rasch & Co.
Was in the partnership of Hiter & Raworth with Thomas Hiter in 1811, but it lasted only a month. Was in the partnerships of Raworth & Biddle 1814-1817 and Raworth & Gordon 1817-c. 1818. Operated a branch store in Portsmouth, NH c. 1845-1860. Worked with his son George W. Raynes as the firm of J. Raynes & Co. 1860-1879. Was in the partnership of Johnson & Reat 1804-1815 and also had a separate business under the name of James Reat & Co. 1812-1815. Modernist studio jeweler. Moved to Spain in 1960 and focused on creating steel sculptures. Founded by John W. Reddall. Makers of sterling novelties and buckles. Makers of sterling flatware, holloware and souvenir spoons. Started as Ludwig, Redlich & Co. and founded by Adolph Ludwig and A. Alec Redlich, the name was changed c. 1895 when Ludwig left the company. Became a division of Elgin Silversmiths in 1946, and they continued the use of the Redlich mark through the 1970s. Was in the partnership of Redman & Potter 1819-1821.